Today, Stan Tekiela, author of Backyard Birds: Welcomed Guests at Our Gardens and Feeders, talks to us about the relationship between birds and plants. Often the most complex relationship between birds and nature is right in front of us, but we don’t see it. For example, Blue Jays are critically important for forest regeneration. 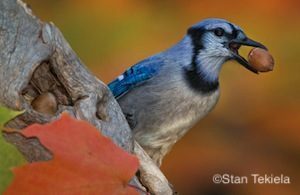 A number of studies link the dispersal of oak trees to Blue Jays. Jays collect, disperse, and cache oak acorns, then later forget where they hid some. The forgotten acorns sprout into oak trees, which extend the stand from the mother tree almost 400 yards per year. Blue Jays surpass squirrels as successful oak tree planters. Birds in flight can disperse acorns farther away from the mother tree than a scurrying squirrel. Some botanists even speculate that oak trees with smaller acorns have an evolutionary advantage, as their acorns are more likely to be dispersed by Blue Jays, Acorn Woodpeckers, and other birds, rather than squirrels. The same kind of relationship exists between Cedar Waxwings and High Bush Cranberry and Mountain Ash. The edible fruit of these plants is highly nutritious and surrounds a seed. The bird eats the fruit and inadvertently consumes the seed, transporting it inside its body away from the mother plant. In fact, many of these seeds won’t germinate without passing through the digestive tract of the bird first! Later, when the bird eliminates the seed, it lands on the ground well away from the source and starts to grow. About the author: Naturalist and wildlife photographer Stan Tekiela has written more than 130 books, including nature appreciation books and children’s books. He is perhaps best known for his popular state-specific field guide series, which now includes books about birds, mammals, trees, and wildflowers. 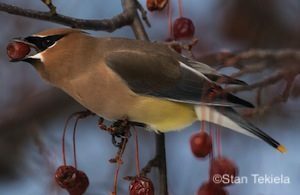 Holding a Bachelor of Science degree in Natural History from the University of Minnesota and working as an active professional naturalist for more than 25 years, Stan studies and photographs wildlife throughout the United States and Canada. He has received various national and regional awards for his books and photographs. Also a well-known columnist and radio personality, his syndicated column appears in more than 25 newspapers, and his wildlife programs are broadcast on a number of Midwest radio stations. 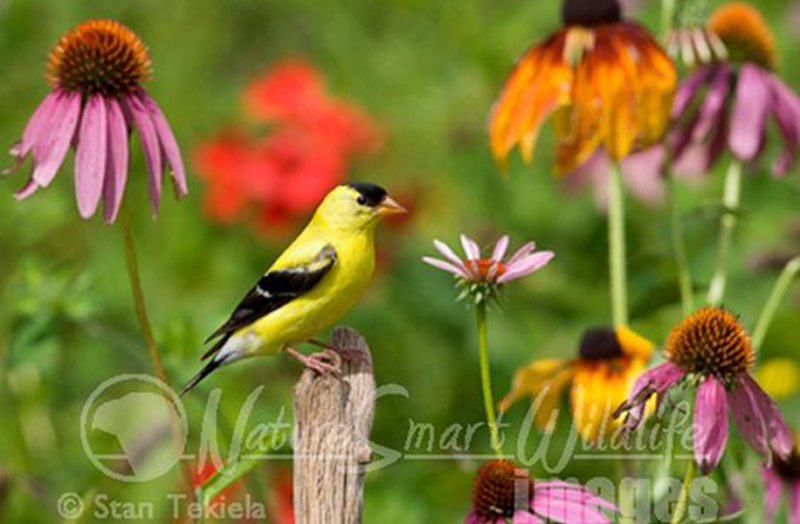 For Stan’s wildlife photography tours, check out his website NatureSmart.